FairyHosting Review 2019: Is FairyHosting a Good Hosting? FairyHosting is a fantastic hosting partner for medium to large businesses in Europe, especially those wanting fast access to markets in Eastern Europe and the CIS (Russian Commonwealth) countries. Their servers run on top-class infrastructure and have been made with businesses’ needs in mind. Estonian brand FairyHosting has been providing server and related services since 2011. 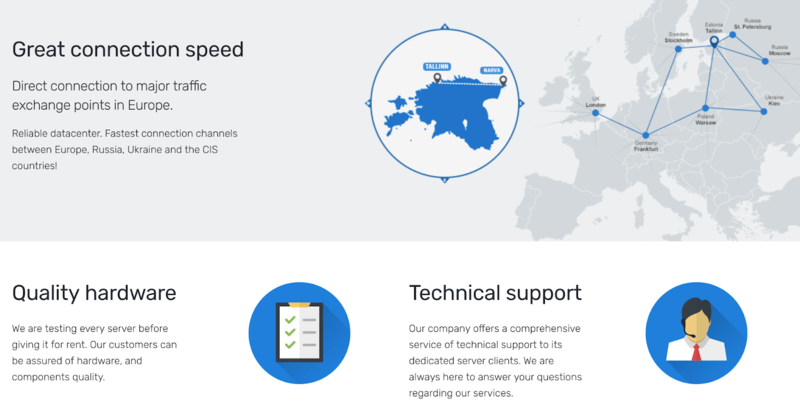 Their goal is to provide fast, uninterrupted, and reliable hosting to medium and large businesses using two data centers and pan-European network infrastructure. In addition to Estonia, they have multilingual staff in Russia and Ukraine, and their website is available in English as well as Russian. Purchasable SSL certificates from RapidSSL, Comodo, GeoTrust, etc. VPS plans can come with up to 4 x 2.8 GHz CPU cores, 150 GB SSD, 12 GB RAM, and 1 IP address. These plans come with up to 100 Mbps connections. Dedicated servers allow up to four hard drives with large amounts of SATA and SSD storage. These servers are powered by Intel Xeon E3/Silver processors with an incredible maximum 768 GB DDR4 ECC RAM. You can really build a solution in a league of its own, and the Intelligent Platform Management Interface (IPMI) allows you to remotely monitor and manage your server 24/7 via the KVM console. The dedicated server plans come with connection speeds of 100 Mbps, 1 Gbps, or even 10 Gbps. VPS and dedicated servers both offer IPv4 and IPv6 support. FairyHosting is quite unique when it comes to the operating systems they offer. Dedicated server customers can choose the likes of FreeBSD and Hyper-V. They also offer more control panel choices including ISPManager, Vesta, and DirectAdmin. Some of FairyHosting’s special services include server rack space rental and router rental. Their routers provide support for VPNs as well as IPSec with guaranteed 100 Mbps ports and connections. These extra routers can be applied directly to your dedicated server solution. FairyHosting’s VPS and dedicated server plans both have monthly, quarterly, semi-annual, and annual billing options. However, when you opt for monthly billing on a dedicated server plan, you have to pay a one-off registration fee, which is fair enough. You can also make quite a few hardware customizations to your dedicated server, which obviously affects the price. Linux comes free on both plans, and Windows has to be paid for, but you can also opt for a number of other free operating systems on the dedicated server plans. It’s a similar story for control panels: ISPManager 5 Lite comes free, but you can pay for the premium ISPManager 5 or DirectAdmin instead. There is no free domain and no free SSL certificate with any plan. There is also no real money-back guarantee unless you request a refund on the same day you applied for the service. However, you do get free website transfers and you can scale your product up or down at any time. All in all, FairyHosting’s prices are very affordable considering that these are VPS and dedicated server products with great resources. Since they focus mainly on providing hosting to businesses, this company knows the importance of fast access to support. Therefore, they provide 24/7 multilingual support via live chat, tickets, email, and even a round-the-clock call center. Put simply, fantastic support is one of the cornerstones of their service, and they are almost always very helpful and quick to reply. Their website includes a small knowledge base with a few self-help articles. Although it’s hard to argue against the FairyHosting’s fantastic hardware and infrastructure provision for businesses, less-experienced personal customers are likely to be put off by their lack of basic features such as web hosting and CMS-specific hosting. Check out FairyHosting’s web hosting options today! Wondering how FairyHosting stacks up against other Web Hosting companies? Enter any other Web Hosting company and we will give you a side-by-side comparison.